Mixed greens, tomatoes, cucumbers, red onions, and peppers. Mixed greens, mandarin oranges, red onions, dried cranberries, grilled chicken and candied walnuts. Dried cranberries, candied walnuts, and goat cheese. Mixed greens, artichokes, fresh mozzarella, cherry peppers and crispy chicken. Sliced NY strip steak over mixed greens, red onions, tomatoes, cucumbers, and peppers. Grilled salmon over mixed greens, tomatoes, cucumbers, red onions and peppers. Mixed greens, tomatoes, cucumbers, red onions, peppers, kalamata olives and feta cheese. 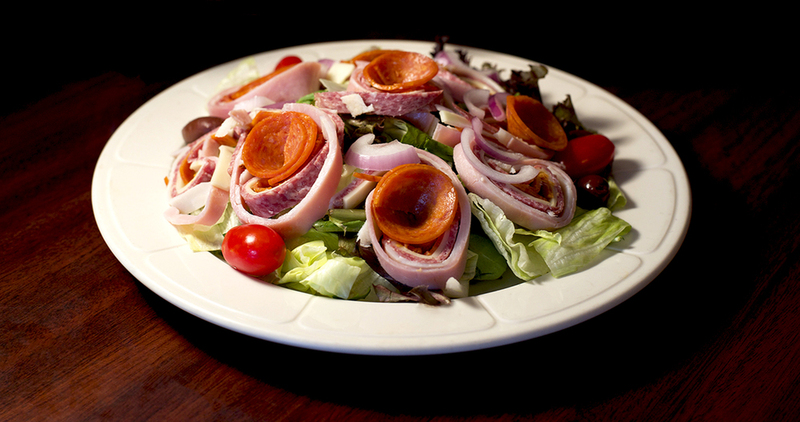 Garden salad topped with ham, genoa salami, turkey, pepperoni and provolone cheese. Our garden salad topped with turkey and American cheese. Our garden salad topped with tuna.